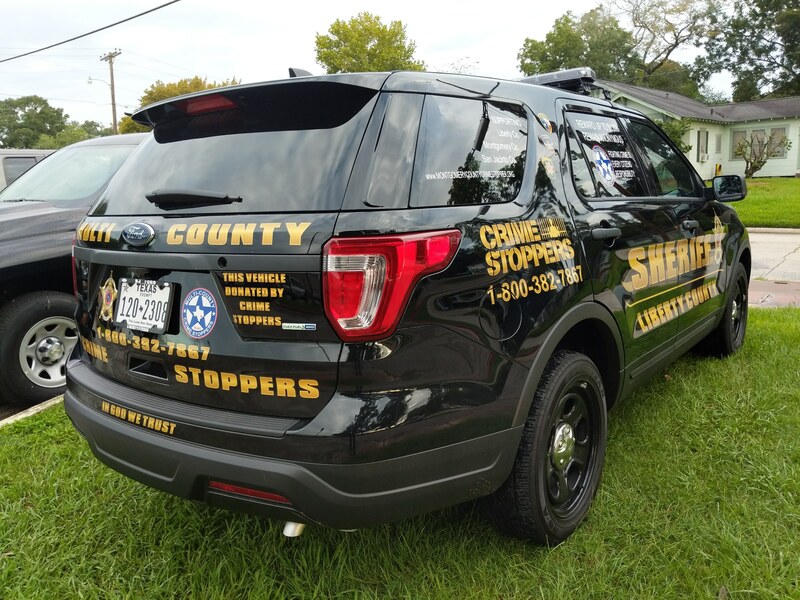 Liberty County Sheriff Bobby Rader recently took possession of a new fully police equipped 2018 Ford SUV “Explorer” donated by the Multi-County Crime Stoppers organization located in Montgomery County. In October of 2014, the Liberty County Sheriff’s Office joined forces with Montgomery County and San Jacinto County in forming this Multi-County alliance and since have worked hand in hand in furthering efforts to clear criminal felony cases in all three counties and have been quite successful. The organization very generously made available to all three counties a donated vehicle to be used exclusively by their Crime Stopper Coordinators with the only request being that each vehicle be marked in such a way as to give the public information regarding Crime Stoppers and show that cash rewards can be given for information leading to the arrest of felony suspects. There are approximately 155 Crime Stopper programs in Texas and they all are managed and staffed by citizens rather than law enforcement personnel with law enforcement serving only as Coordinators. The Multi-County program is funded primarily by probation fees from Montgomery County and San Jacinto County as well as public donations and fund raising events. From these funding sources the rewards for information leading to the arrest of felony criminal offenders are drawn, therefore basically what happens is that criminal offenders are paying to catch other criminal offenders with no cost, whatsoever to the tax paying citizens of our respective counties. Sheriff Rader expressed his deep appreciation to the Multi-County Crime Stopper organization for this most generous donation to the Sheriff’s Office and has assured the organization that the vehicle, which has been assigned to the Special Operations Division, will be utilized in such a manner as to further the objectives and goals of this dedicated crime fighting organization.